For almost 45 years, India avoided full diplomatic relations with Israel fearing tensions from the Muslim minorities. Then, BJP encouraged Narasimaha Rao to befriend Tel Aviv in the national interest and the full diplomatic relations was formally announced on January 29, 1992. No heavens fell. Syed Shihabduddin, the former IFS officer, who joined politics to emerge as the voice of Indian Muslims, was perhaps the only protester on Delhi streets against the decision, that day. It was in this backdrop that Israel’s Foreign Minister Shimon Peres flew to Delhi for a landmark visit on May 17, 1993. The two countries signed some agreements of mutual cooperation. After his official interactions were over, he called on Lal Krishan Advani on May 18, the last day of his visit. It was in this meeting in which Advani “favourably responded” to Peres’s suggestion of “replication of demographic transformation as Israel had done in Palestine, to change the composition of population in Kashmir by settlement of non-Muslims there”. But once the talk moved to the newspaper front pages, there was massive reaction. Delhi out-rightly denied executing any such plan. The then Home Minister S B Chawan had to reassure that it is not happening. But the idea of ethnic flooding, off late, has emerged as a major player in changing demography of various small geographies. China has been accused of doing this in Tibet. It is paying huge amounts to support the families who are settling in Tibet. It has successfully done in restive Xinxiang region. Peres had a long career. He became Prime Minister and President of Israel. Post-retirement, he had flown to Delhi as a private citizen in November 2014, and wanted to meet “India’s new leader”. Israel ambassador Daniel Carmon put in the request with PMO. Peres died on September 28, 2016. “Peres would be remembered as a steadfast friend of India,” Pranab Mukherjee, the then President of India, said. Peres died but not the idea he had given to Advani. Almost 24 years after, Kashmir is facing the prospects of ethnic flooding as the ruling right wing’s foot soldiers have taken the judicial route to undo the restrictions that prevented a demographic change of J&K, read Kashmir, for such a long time. It is Article 35 (A) of the Constitution of India that is at the core of a writ petition with the petitioners pleading that it must go to the dustbin after 63 years. Article 35 (A) empowers J&K’s state legislature to define “permanent residents” of the state and extend to them special rights and privileges including employment in state government, acquisition of immovable property within the state; settlement in the state; and right to scholarships and such other forms of aid as the state government may provide. The Sangh Parivaar is working on multiple fronts in J&K. BJP is formally part of the ruling coalition with PDP and their common minimum programme (CMP), the Agenda of Alliance, is committed to the protection of the special position of the state. But the right-wing clan is a full basket. Certain things are being done at administrative levels in which officials play a key role. These days, for instance, the emphasis at the bureaucratic level is that state government should avoid making efforts in framing policies on its own and instead copy the central government templates! Urdu is the official language but it has died long ago in the power corridors. Those not in power politics, however, have taken other routes to achieve the targets that Agenda of Alliance wishes to protect. So they have taken recourse to the judiciary. Earlier it was enforcing a ban on beef in the state and now it is 35 (A). They have a huge success to their credit. With the support of Congress that was in the government, incidentally led by PDP founder Mufti Mohammad Sayeed, they succeeded in winning a huge case in the High Court. Filed by women who had married non state subjects, the case was the first blow to the state subject law. Though the natural way-out was the state could have legislated a strong law, the Congress ensured that the PDP does not take that route. Right now, the state subject system is partially hallowed already. That case is the text book explanation about how targets could be hit outside the political chessboard without making a claim. On July 23, 2014, the rightwing NGO We the Citizens submitted a writ petition before the Supreme Court. The petition revolves around the narrative that the state of J&K was always part of the Indian Union of States even before Maharaja Hari Singh signed the instrument of accession in wake of tribal raids in October 1947. It argues that Parliament is the sole institution empowered to amend the constitution. But the President of India invoked Article 370 of the Constitution and added Article 35 (A) to the Constitution of India in respect of J&K which is beyond the jurisdiction and power of the President of India. The petition sees the amendment plainly unconstitutional and wants its reversal. Seemingly, the petitioner’s problem is more with the consequences of the Article 35 (A) rather than the powers exercised by the President of India. Article 35 A, is in conflict with Article 14, 19 and 21 of the Constitution of India because “it creates a special class of citizen within a class of citizen of India” so it is “highly discriminatory”. The petition is against the prohibition to the non state subjects who can neither acquire land nor become the state subjects and cannot get jobs or scholarships. So the petition is seeking a direction or order declaring that Constitution (Application to Jammu & Kashmir) Order 1954 as contained in Para (j) adding new Article 35 A to the Constitution be declared “ultra virus the constitution of India and invalid”. The Supreme Court had issued the notices to the centre and the state government. While the state government has responded, the centre is yet to respond. It is this non-response that indicates that We The Citizens are apparently state backed. “A conscious decision has been taken by the Government of India not to file any counter affidavit in the case because the issues which are raised for adjudication are pure questions of law,” Attorney General KK Venugopal was quoted saying. Earlier, according to a news web portal, he had told the Chief Justice J S Khehar-headed bench that given the “sensitive” nature of the issue, the Centre wanted a “larger debate” on it. “He also asked that the matter be referred to a larger bench given the constitutional issues involved; the court agreed, saying a three-judge bench would hear the matter in six weeks (which finish at the end of August),” the portal added. Now notices to the central government on Kashmir’s special status are just a matter of routine. Kumari Vijayalakshmi Jha had challenged Article 370 in Delhi High Court that dismissed the plea. She has now challenged this order in the Supreme Court. A bench headed by Chief Justice has asked the Centre and the J&K government to file their replies in four weeks. 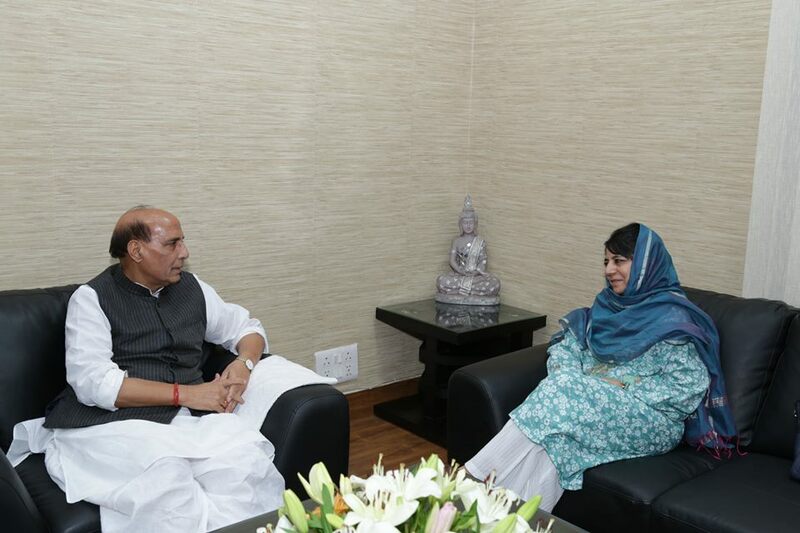 CM Mehbooba Mufti with Rajnath Singh. In its brief response to 35(A) petition, the J&K government has stated that since the issues were already adjudicated on two separate occasions by separate constitution benches of the Supreme Court in Puranlal Lakhanpal versus President of India and Others (1963) and Sampat Prakash versus State of J&K (1969), it is no longer res integra and needs to be dismissed. State response sees the petition as “legally misconceived” hit by “extraordinary delay and laches”. Article 35 (A) is in vogue since May 14, 1954 and after six decades, it is being challenged as being illegal and unconstitutional! The state government has missed many things in the affidavit. Article 35(A) is not traceable in the Constitution of India. It is found only in the version that is applicable to J&K. In the 1952 agreement, Delhi agreed to protect the state subjects and give authority to the state legislature to legislate on issues related to them but they were regarded as citizens of India. In 1954 after J&K’s Constituent Assembly ratified the accession, it was deemed essential to abolish separate citizenship of J&K. “Discussions were held between the representatives of India and Kashmir and a compromise was reached,” Justice Adarsh Sen Ananad, former Chief Justice of India, has recorded in his book. “The Government of India agreed that the permanent residents of the state could have special rights but they were to have the common India citizenship”. Since then ‘state subjects’ were replaced by ‘permanent residents’. It was only after this that the President issued Constitution (application to J&K) Order, 1954 on May 14. “In accordance with the agreement between the representatives of India and Pakistan, that the state legislature would have the power to make special provisions for the ‘permanent residents’, it was deemed necessary that some provisions be made in the Constitution to cover that case,” Justice Sen writes. “Accordingly, Article 35A was inserted by section 2(4)(j) of the Order, 1954”. Now, J&K government has hired top lawyer Fali S Nariman to defend the case. The next hearing is expected early September. But the interesting spin is that in a BJPDP government in J&K, PDP has filed the response to the notice but in Delhi where BJP is in power, it has avoided the same thus keeping the tension high. The petition in the top court in India was moved only after all other means of managing the J&K demography failed. J&K is perhaps the only state in entire sub continent, where demographic upheavals have remained a routine and a continuous process right from 1947. First major jolt was the Jammu massacres in October and November 1947. The subsequent two wars in 1965 and 1971 witnessed massive emigrations. Under the state policy, thousands of families had to move to Pakistani side of Kashmir. The militancy eruption in 1998 triggered various kinds of migrations involving people living near the LoC, the Pandit minority and those who fled for political reasons. Despite all this the Muslim majority character of the state remained unchanged. 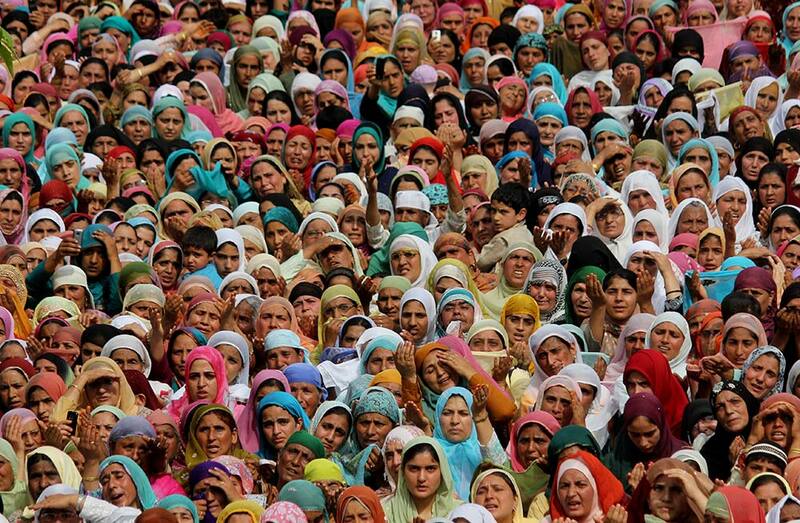 The 2011 headcount suggests the Muslim population makes 68.31 percent of J&K’s 12541302 people, the highest percentage after 1947 when Muslims formed 72 percent of then princely state’s population. Hindu population remains at 28.43 percent. Fertility Tables suggest against 85,157 live births in the Kashmir Valley in the year preceding Census 2001, there were 176673 births in 2011. Total Fertility Rates (TFR) are declining everywhere across India. However TFR of Muslim women in Kashmir have increased from 2.6 to 3.9. In case of Hindu women in Jammu, TFR has nosedived from 2.19 to 2.03. If the number of children in the 0-6 year age group per hundred of the population is taken as a parameter, Muslims in Kashmir are much ahead of all other communities in the state. Against 14.64 children in every 100 population in 2001, Muslims in Kashmir now have 17.83 children per hundred population in 2011 – a net increase by 3.2 kids per 100. In contrast, the number of children among the Hindus have declined from 13.30 to 12.04 per hundred, a net fall by 1.26 kids per one hundred people. Interestingly, the number of annual births among Kashmiri Muslims has increased by 84 percent – from 1.16 lakh in 2001 to 2.14 lakh in 2011. In contrast, the numbers of Hindu births have increased by only 17 percent, from 47.6 to 55.6 thousand. In such a fertility challenge that has already changed demographic character of Ladakh – the arid region is a Muslim majority belt as Buddhist growth rate is phenomenally low, the only possible intervention is seemingly to open the sluice gates. That is what exactly the abrogation of Article 35(A) will do. 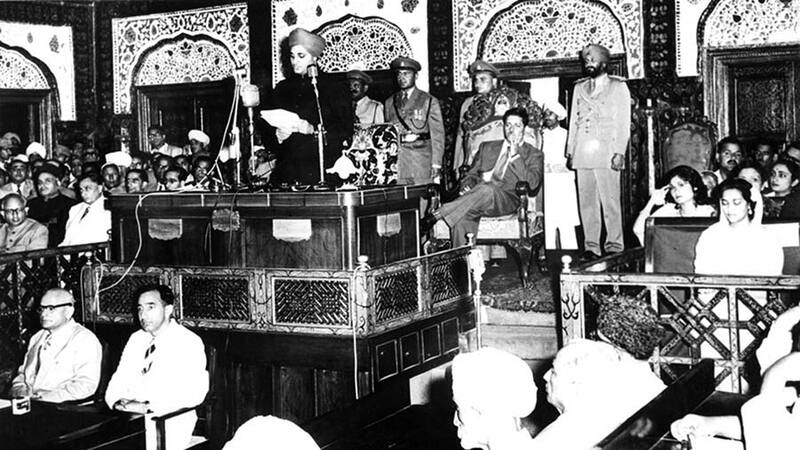 Karan Singh, Sadar-i-Riyasat, J&K, addressing the Joint Session of Jammu & Kashmir Legislature in August 1957. If the Supreme Court upholds the petitioners’ story, J&K is headed for serious consequences. Though it has lost most of the exclusivity that it negotiated in 1952, between 1953 and 2017, erasing of 35 (A) will make it much inferior to the neighbouring Himachal Pradesh. With every citizen in India getting the right to own land in the state, as the permanent citizenship will make a final walk into the history texts, J&K will become an outhouse for the Indian middle class. Once the protection against acquiring immovable property is over and the non locals can settle, the demography will automatically change. Even if there is not a single settler from plains of India, the first benefit will go to the West Pakistan refugees who have been living in Jammu districts since 1947 but lack any rights over land, or any right to vote in the state legislature or get employment. They were 5764 families in 1947 at the time of migration from West Pakistan and now have grown four times. They would not require any concession, once 53 (A) is laid to rest. In that situation, the slum dwellers in Jammu’s Gandhi Nagar constituency will not be disturbed and the Congressman who settled them to create his exclusive vote bank will automatically become the owners of the spaces they occupy. Post 35(A), they can switch sympathies and become BJP cadres. Even the lawmakers, who in their earlier avatar as revenue officers, managed literal sale of Permanent Resident Certificates (PRC) to the willing population from Punjab will no more move on Jammu’s Wazarat Road with a sense of guilt. J&K government will have to close the Permanent Commission that is tasked to investigate the cases of fake state residents. By now, it has more than 500 cases registered, mostly established as non-state subjects, living in Jammu, Samba, Kathua and Udhampur. Once 35 (A) becomes history, they are as good citizens of Kashmir as Omar Abdullah or Mehbooba Mufti is. Once they get citizenship rights and a permanent address, no power on earth can deny them their voting rights. Instantly, this population will become the main king maker in the state, a position that is currently with the Hindu heartland since 2002. Delhi’s costs will not be less. If the Court agrees to the petitioner’s argument that Article 35(A) is a constitutional sin, the Constitution (application to J&K) Order 1954 will cease to exist. That will reverse almost everything, to the extent that Article 370 will get reborn in its basic form. A follow up would require negotiations because Constitution of India forbids any extension including ceding of territory in J&K, without the recommendations of the J&K state legislature! The main focus of the petition is that 35(A) is unconstitutional because the President has taken over the role of the Lok Sabha. The possibility of the Court undoing the major Constitution (application to J&K) Order is remote because it will push Delhi into a new constitutional labyrinth. Seemingly, the outcome of the entire ongoing efforts would be to maintain status quo, thus taking the route of Resettlement Bill which is parked in the Supreme Court. Constittional experts say Delhi can not do it and Srinagar can not afford it. One option is to address the petitioners’ concern who have detected that India lived in a constitutional sin for so many decades. Why cannot PDP ally go to Lok Sabha and pass 35(A) and help it anchor with Article 35 of the Constitution of India. At the same time, PDP in J&K can bring in a strong and comprehensive state subject law that will also take care of the bill which it lapsed in 2005! 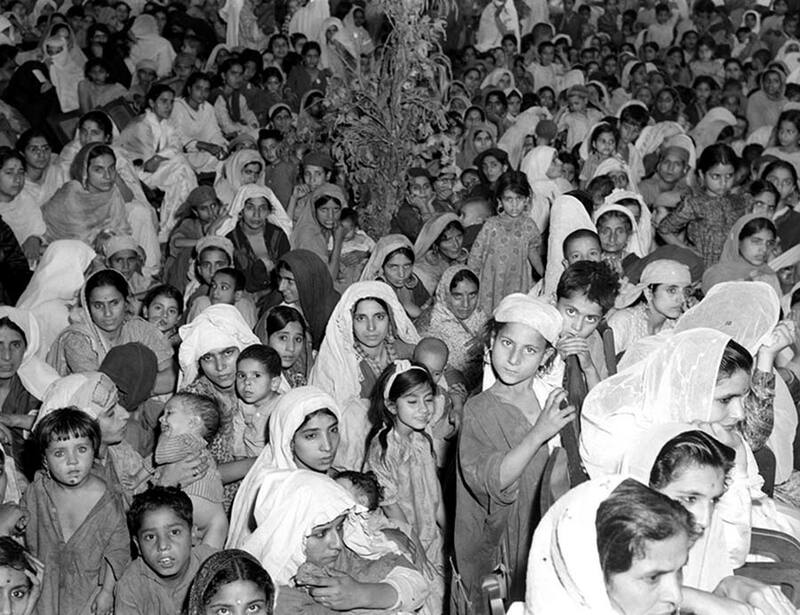 Kashmiri women participating in the Baby Show held at Srinagar on September 25, 1949, during the meeting of the National Conference. Article 35 (A) has scared Kashmir’s unionist camp. Apparently for the TV cameras and the newspaper front pages, however, they seem to have discovered a common cause. The three hour long meeting attended by almost all the parties, barring PDP, came to the conclusion that the abrogation of 35(A) would make all the three regions “suffer badly”. They have decided to launch an awareness campaign from August 14. Dr Abdullah told the meeting that the issue is very important and the Chief Minister has also threatened to resign in case it happens. He said that the state government has not sent a proper person to represent the case in the Supreme Court. Ms Mufti said that there is no justification for 35(A) to be in the Supreme Court and if it is harmed, “Kashmir mein National Flag Kou Kanda Deanay Walla Koi Nahin Houga.” At a latter event, the Chief Minister said that “we are all Kashmiris” and “we should get closer to address the problems Kashmiri is afflicted with”. Perhaps it was in this backdrop that Ms Mufti drove silently to the residence of Dr Farooq Abdullah for a 20-minutes meeting at his Gupkar residence. “There were many issues but the emphasis was on 35(A),” a PDP insider said. “She was assured by Dr Abdullah that she must prevail upon the central government and advise them against abrogating 35(A).” The insider said that the “two leaders found out they were on the same page”. Omar Abdullah was part of he meeting and it was his tweets that broke the news. NC president, Dr Farooq Abdullah presiding all party meeting to discuss Article 35 A. 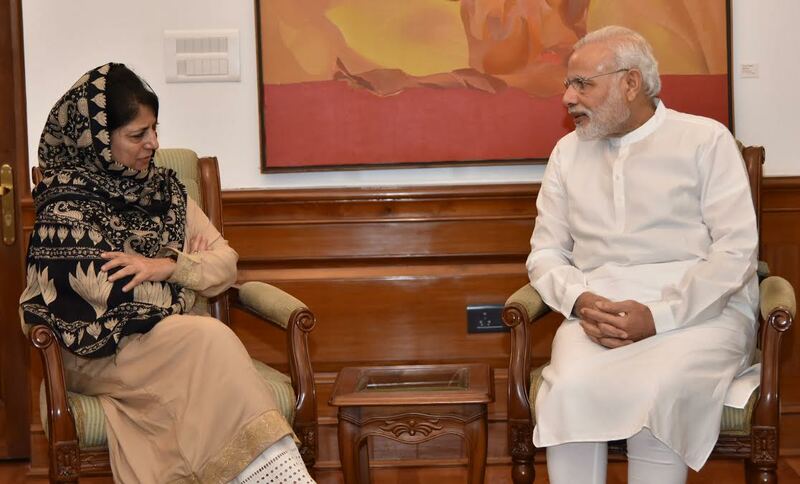 A day later, Ms Mufti had a meeting with other opposition leaders. Part of a “wider consensus”, the meeting discussed various suggestions that opposition members Mohammad Yousf Tarigami, Ghulam Hassan Mir, Hakim Yasin and Congress state president Ghulam Ahmad Mir made. One suggestion was that the cabinet must react to it formally. The other idea was that a high level, all party delegation must fly to Delhi, meet the Prime Minister and other political leaders to inform them about the crisis it will lead to. Where the debate will lead to, nobody knows. 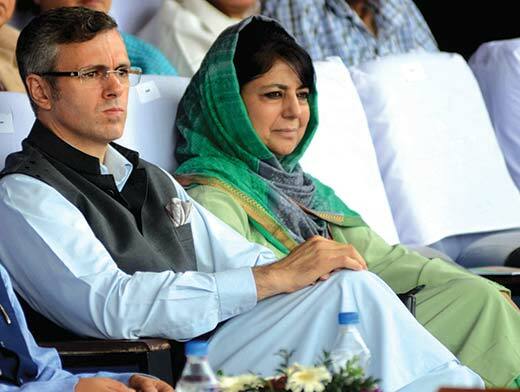 Omar Abdullah sees 35(A) as the other side of the coin – the accession. “If there is debate on (the legality) of the Article, you will have to debate the accession itself,” Omar told Indian Express. “Like Article 370, Article 35A was negotiated between the princely state of J&K and the government of India and it is the bedrock of accession… Are they ready for a debate on accession?” Article 35(A) abrogation will turn history’s clock back, almost 42 years after Mrs Indira Gandhi refused to do so in wake of Indira Sheikh Accord. The situation has created a new ally to the unionists: the separatists. 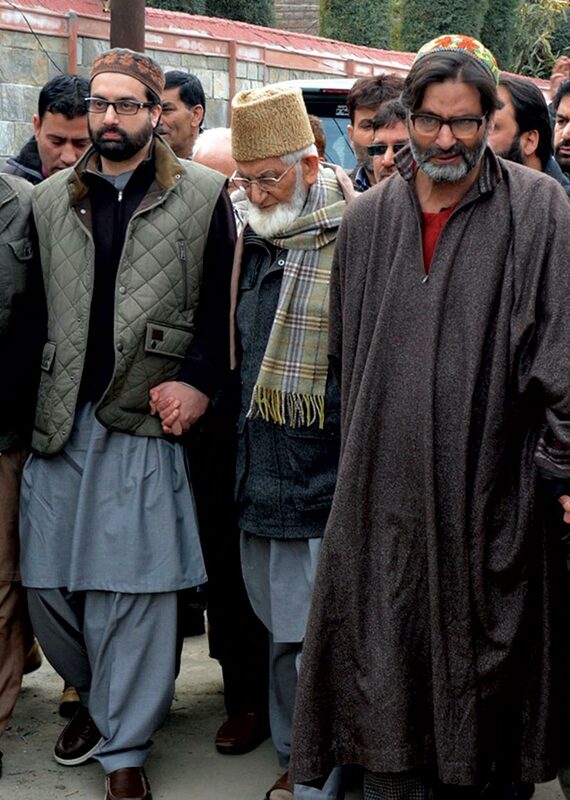 The separatist triumvirate comprising Syed Ali Geelani, Mirwaiz Umer Farooq and Yasin Malik – currently facing a high pitch investigation by the NIA, have already called for a day long weekend strike, using the only weapon in their arsenal. Chief Minister Ms Mufti’s panic is understandable. Any tempering with special position can cost her remaining political career. This is especially because part of the votes her party managed in 2014 was by creating a scare about what BJP can do if it gains power.